Dealing with dog burns and and canine wounds caused by accident or encounters with other dogs are distressing for both dog and the owner. A burn is basically a type of wound so we will deal with both kind of injuries here and, although all kinds of wounds can be very painful indeed for the dog, they can be treated. As humans we know that any type of burn is extremely painful so we can emphasise with what our canine friend is going through. Most dog burns occur because of an accident in the home - usually the kitchen. I have seen or heard many times of dogs being scalded by hot liquid from an overturned pan or a dropped cup of coffee. Other burn injuries can be caused by the dog laying too close to a fire or radiator. In all cases treatment needs to be administered quickly. Unlike canine burns dog wounds are more likely to occur by conflict rather than by accident with bites and gashes from fighting being the most common cause of open wounds. If your dog suffers any kind of wound he must be immediately taken to an emergency vet. It is vital to assertion the severity of the wound as quickly as possible. The vet will be looking at the size and depth of the wound combined with where it occurs on the body and will need to discover if there is underlying muscle, tissue or blood vessel damage. More information can be found on our Dogs Skin Problems pages. In the case of scalds soaking a towel in cold water and draping it over the dog will help to reduce the pain but of course the dog needs to be quickly taken to the vet. Burns will vary greatly in their severity, minor burns may very well heal themselves with little or no treatment whilst more serious cases will require surgery and possibly skin grafts. Most burns will require antibiotics. With very minor wounds cleaning them thoroughly and administering antibiotics may be all that is required to treat the injury. 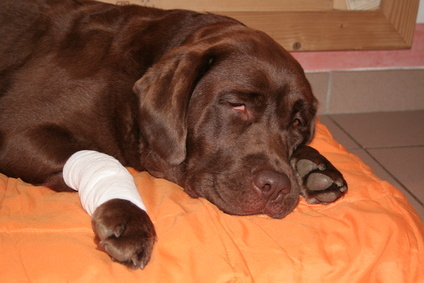 Unfortunately deeper wounds may need to be treated with surgery to repair and close the injury. In the most severe and serious cases, and let's home this never happens to your dog, it may be necessary for skin grafts to be carried out. All wounds and burns that result in skin loss will require stitching to help the skin bond and recovery should be swift with the stitches being removed after two weeks. Sometimes dog burns and canine wounds will be left open. This is usually when the injury happens in a vulnerable area such as on the hip joint. In these cases the affected area will need to be carefully cleaned a couple of times a day with an antiseptic solution. Leaving the wound open allows the wound to scab and for new skin to regrow naturally to gradually seal the wound. In these instances of course it is vital to prevent infection by cleaning the wound regularly and keeping close tabs on the dog to ensure he doesn't compound the injury with any further mishaps.